Instead, I turned down the volume on the television and turned up the sound on the radio. 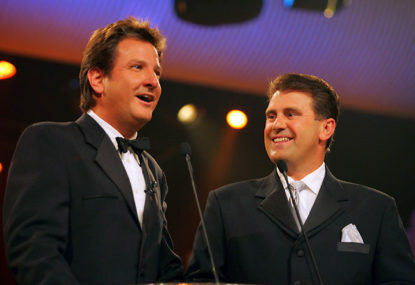 I spent the summer listening to the wit and wisdom of the ABC Grandstand broadcast team, the likes of Jim Maxwell and Chris Rogers, Gerard Whateley and Allison Mitchell, Dirk Nannes and Simon Katich. Had I kept the television unmuted, I would have to endure dirty rotten pizzas, Nerds and Julios, Here come the Habibs and James Brayshaw. That’s not to say I don’t like the Nine broadcast. The graphics and presentation are top notch, even if the Nine Eye 3D stuff is a bit pointless. They were the original innovators in sports broadcasting and clearly have a dedicated and passionate group of people working behind the scenes. But the on-screen talent is severely lacking. While there are a few gems hidden in the Nine broadcast team, (Mike Hussey for instance, is great) the commentary over the last ten years has gone downhill. After Kerry Packer passed away, the broadcast became a shell of its former self. Michael Slater, James Brayshaw and Ian Healey have become unlistenable. I feel for Ian Chappell, the only member of the original broadcast team who has to work with these clowns. He must reminiscence like the rest of us back to the days of Lawry, Beanud and Greig. The coverage has also become increasingly one-sided. The biases of many commentators are unchecked. There has been a distinct lack of international commentators, limited only to Mark Nicholas, there as a presenter, and David Lloyd, seemingly employed only for laughs, not insight. The decline of the Nine commentary team is even starker when you consider that the state of their free-to-air competition. Network Ten’s handling of the Big Bash has been exemplary. They have fantastic on-air talent; Ricky Ponting being the highlight, a great caller and interviewer, who now works with Sky Sports in the UK. The coverage strikes the right balance of banter and insight, with the commentators opting to focus on the game, rather than joking among themselves. Interestingly this is reserved for the formate considered by some to be ‘hit and giggle’. It’s almost as if they remember that they are actually broadcasting to a broad audience, as opposed the NSW Blues locker room. The fact that Ten’s coverage won a Logie, while Nine’s wasn’t even nominated sums up the situation. However, as of this morning, it looks like we have hope of reform. Brad McNamara, former all-rounder for NSW and head of Nine’s cricket coverage, has left the organisation to pursue other interests. McNamara has been a long-time target of fans. He copped a fair whack of criticism from the likes of Gideon Haigh and Geoff Lemon and seems to enjoy getting into arguments in the comments of articles. He even admitted he had a google alert on his name (Hi Brad, if you’re reading this. All the best with what comes next). I have nothing against McNamara, but I do believe that his departure will be a good thing for the coverage of cricket in Australia. It’s not about the replacement being any better qualified than McNamara, but a breath of fresh air to remove the stench of the ‘dirty rotten pizzas’ currently inside the Nine commentary box will be much appreciated by the masses.